41.7 Round Portable Aluminum Spiral Counter Display Case with Shelves, Clear Panels and Custom Panels. We offer printing service for you, and you just need to send us the final artwork in JPG, PDF, PS AI, TIFF, format; CMYK ONLY, at least 150DPI. 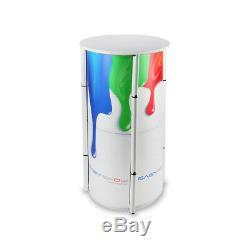 Description Attracting attention at first sight in the whole trade show, trade show tower display is online sale now. 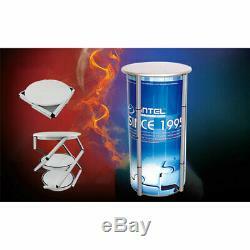 The product is made of durable material including aluminum alloy for frame, acrylic for substituent of glass. 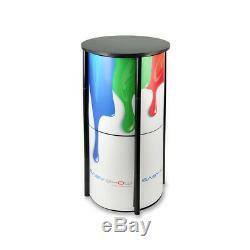 Aluminum folding twister tower are very effective display case system. One-minute quick installation and removal, convenient and quick. 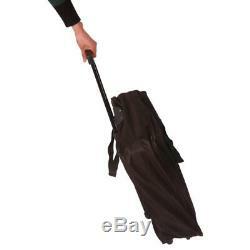 They prove very portable and fully collapsible for easy transportation between events. The custom panels will allow booth visitors to still see within the twister tower, or you can also leave out the panels to get the products in shelves directly. And the panels are removable, you can set it DIY. 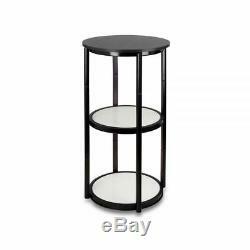 Perfect used for: Sales reps/ Exhibition events/Retail Out-lets/Office Reception areas or any location, that requires a simple assembly and a very dramatic display. Remarks: You need to tear off the membrane on the surfacewhen you want to use it. 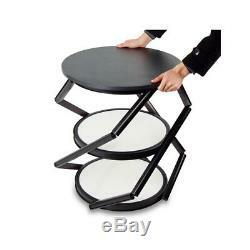 Aluminum spiral tower structure, portable and folded, easy to carry between events 2. Easy and fast to set up and dismantle, no tool needed. Foldable frame, one minute quick installation and removal 3. Excellent for trade show displays. Various frame colors available: black or white, also could do custom color. Clear and Custom Removable PVC Panels 6. With Higher quality, longer service life 7. Foldable frame, one minute quick installation and removal. We are the first supplier who can make this display stand, full of experience. As a supplier, we provide high quality product at good price as well as good service. Quick turnaround time, small orders are acceptable. We have very strict QC policy for IQC, IPQC, and OQC; and make sure each product a success before it leaves the factory. With ISO9001, ISO14001, CE certificate; SGS, and BV certificate. 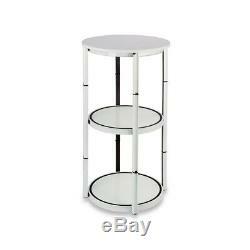 Specification: Frame Material: Aluminum Panel Material: PVC Panel Size: 39.5cm50.6cm Quantity of Panels:6PC Frame Size: 41.7" H Shelf Size: Ø50cm Package size/ctn: 24.8"x7.87"x24.8"(630x200x630mm) G.
Twist & Snap Aluminum Frame 2. Includes 6pcs Custom Removable PVC Panels. The item "41.7 Round Portable Aluminum Spiral Counter Display Show Case with Custom Panel" is in sale since Wednesday, February 13, 2019. 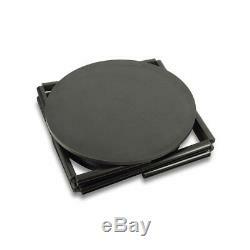 This item is in the category "Business & Industrial\Retail & Services\Racks & Fixtures\Display Cases". The seller is "signagemaker" and is located in Beijing. This item can be shipped worldwide.